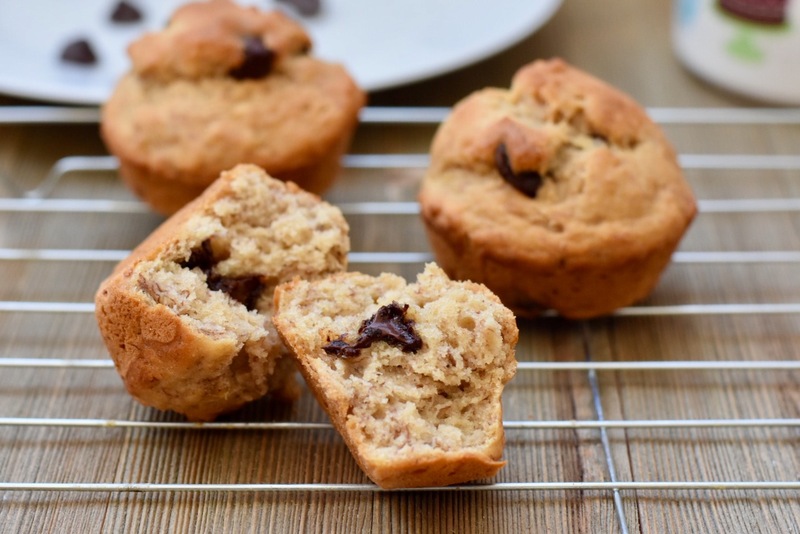 Looking for perfect holiday treat recipe for your friends and family?, then eggless banana chocolate chip muffin is great way to make your dessert or breakfast without sugar. 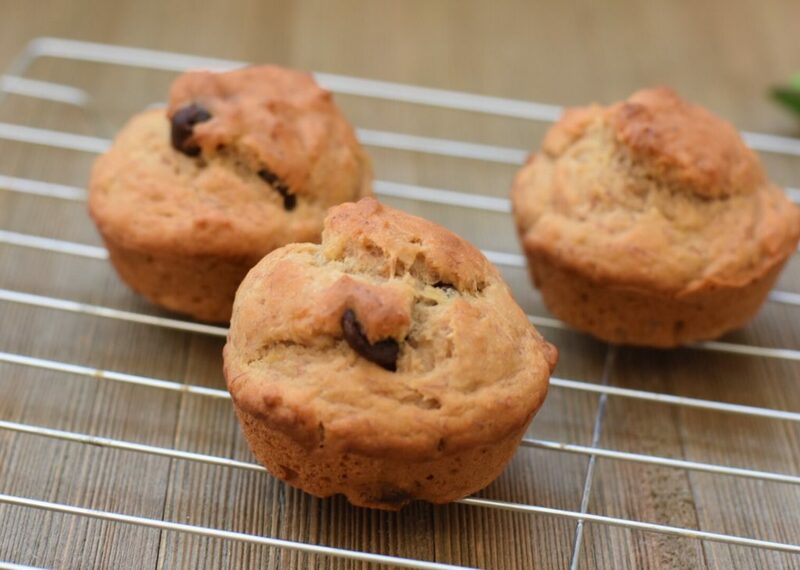 Perfectly ripe bananas are my favorite ingredient and this muffins are my daughter’s favorite. Banana gives this dish balance sweetness and making them moist without an egg. I love muffins more than pancakes or waffles because it does not require any extra sugar syrup plus it saves lot of time. 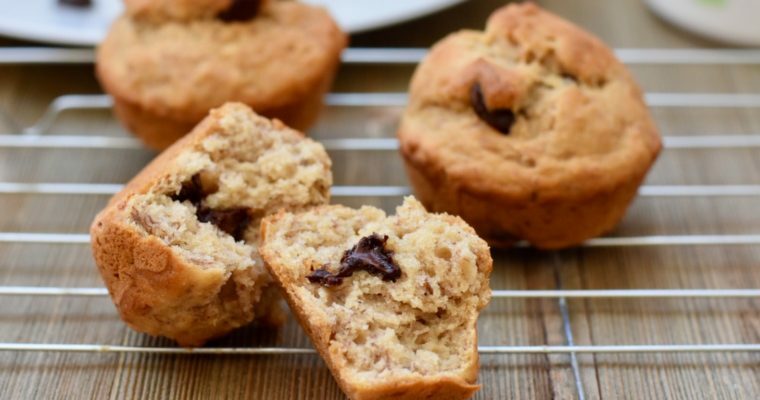 Soft banana and chocolate chips whole wheat muffin without sugar and egg. Sift all dry ingredients together except chocolate chips. Take another bowl add oil and butter and whisk them together. Add remaining wet ingredients and mix it thoroughly. Preheat oven at 375 *F.
Add all the dry ingredient to the wet mixture in batches and fold them gently. Grease muffin pan with cooking spray/ oil / butter. Use ice cream scoop and divide mixture equally in a pan. Tap muffin pan once or twice and bake them into the preheated oven at 375*F for approximately 20 mins or till you see the cracks on muffins. Don't forget to check them with the toothpick, if it is coming out clean that means it's done. Take it out and wait for a minute or two then cool it on the cooling rack. Once it is cool completely then store it in a airtight container for 1-2 days. For dairy free version use almond milk if needed. For Vegan recipe if require add agave instead of honey and almond milk instead of cow milk. Make it in a mini cupcake pan for parties or potluck purpose. You can add some nuts like walnut to make them more healthy. 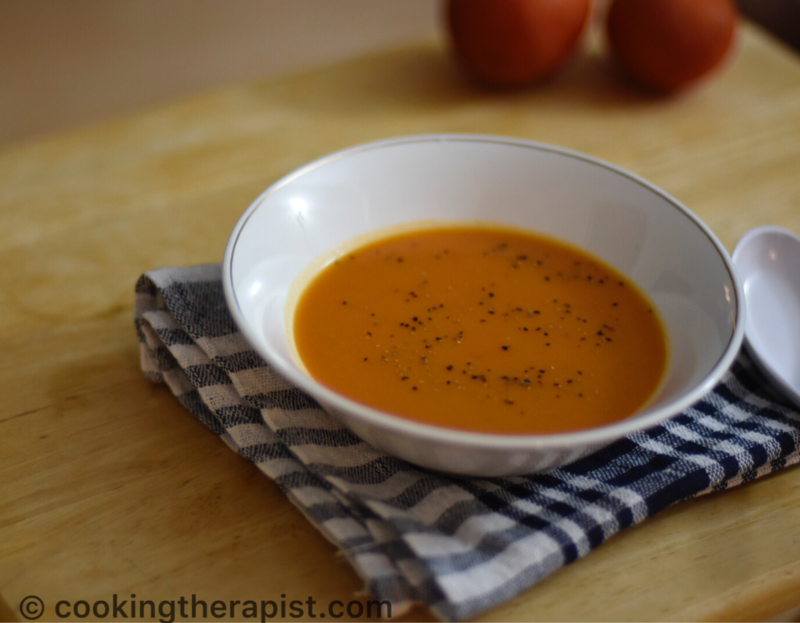 You can add flax meal to make it more nutritious and moist. 1 tbsp of flaxseed meal and 2-3 tbsp of water and stir it well. Use this in wet ingredient. If you don’t have oven then use big pressure cooker and add salt to it. Preheat it and once it is properly heated add muffin pan into it. cover the lid but don’t forget to remove whistle. Bake it on high to medium heat for approximately 18-20 mins. check the doneness with using toothpick. 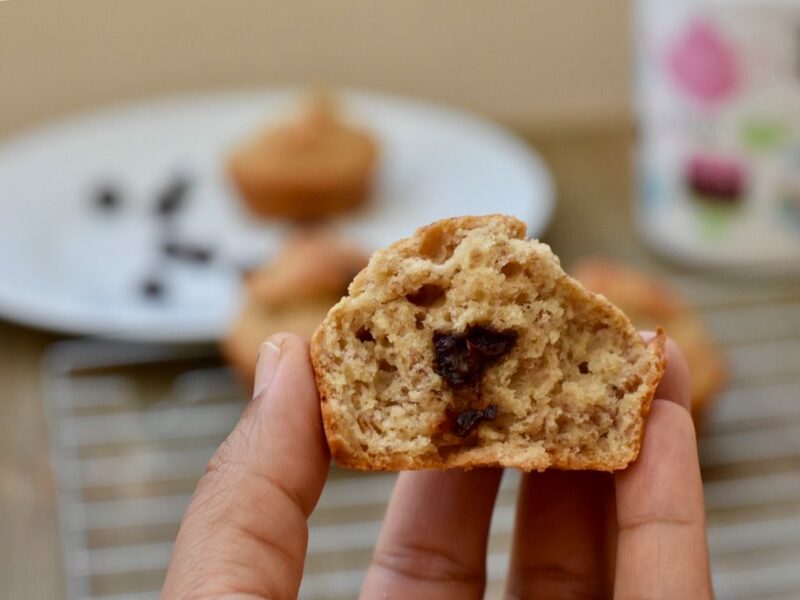 Do try this sugar free muffin and let me know that what is your favorite breakfast item? Don’t forget to check my other kids friendly or breakfast recipes like Weight watchers sizzling brownie, Pumpkin and chocolate chip muffin, Broccoli upma, Baked vada sambhar, Tandoori Mushroom Sandwich, Basil pesto sandwich dhokla.